Is it a dragon? Is it an alligator? 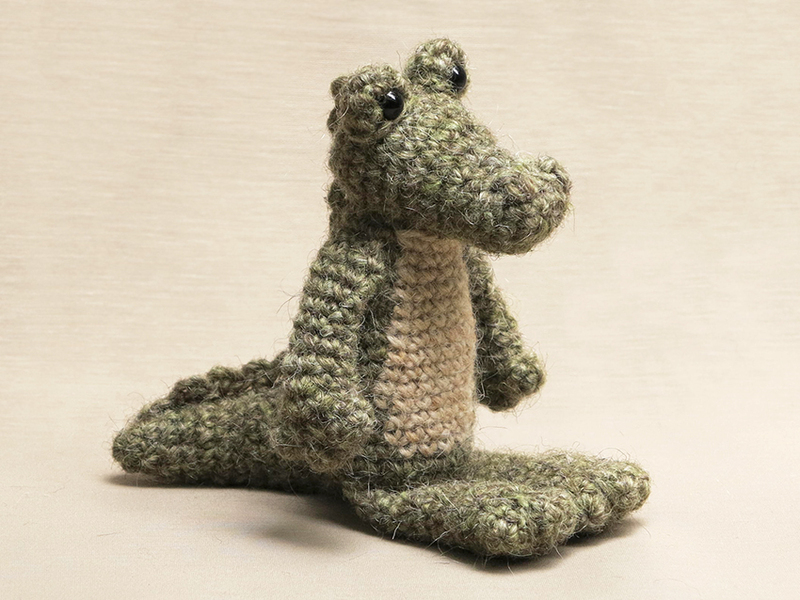 No, this is Drago, a cuddly crochet crocodile! 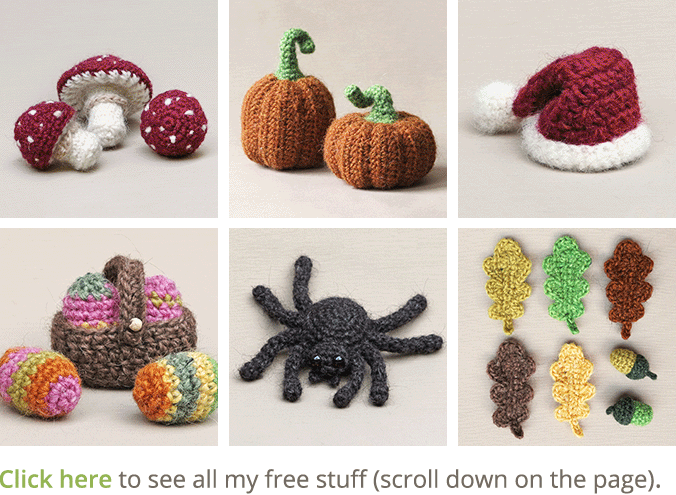 After a long holiday break I am so glad to present this new crochet pattern. To be honest, I was a bit worried I might have lost the skill to come up with something good enough. Looking back now that’s me being a bit insecure. 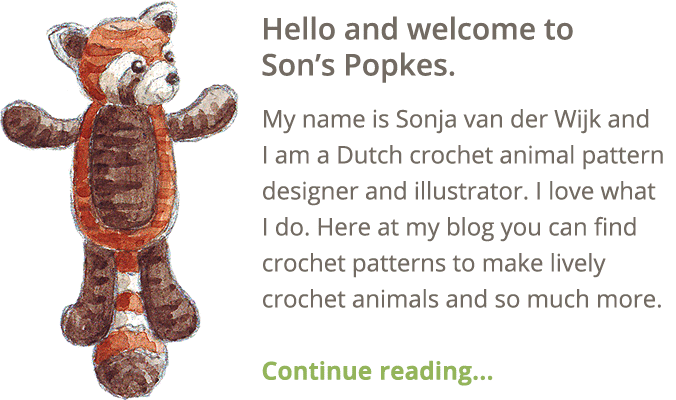 When I finished the head of this crochet animal I was so relieved. I made a sweet looking head which looked like an actual crocodile or alligator, like the kind and cuddly version of the fierce animal. Usually, when I design a new crochet doll, I look at many pictures of the real animal for inspiration and always am delighted by their beauty. On this case however, I mostly used pictures of plush crocodiles as inspiration. Of course I took some peeks at the real animal and kept its features in mind, but I didn’t fell in love with these reptiles. Some of you might think when seeing Drago, ‘where are the special stitches you were going to do?’ Well, I later realised I am crocheting in a spiral, which means a popcorn based stitch, which creates the horny surface of the back, would never become symmetrical but the stitches would lean towards one side. That meant I needed to make a big flat piece you sew to the back which I don’t like. Also, when I had a prototype crochet crocodile, I liked the idea of a horny scaled chain much better. I was going to place two next to each other, which is most realistic, but that made Drago look way too bulky. My boyfriend said, ‘why don’t you just do one in the middle?’ So, I tried that and it look lovely. And exactly what I had unconsciously in mind in the first place as you can see in the sketch. Anyway, to sum up this long story, Drago has become the friendly but recognisable crocodile I hoped. Here you can see him from another angle and below the picture you can find all the info about this crochet crocodile pattern and the links to buy it. 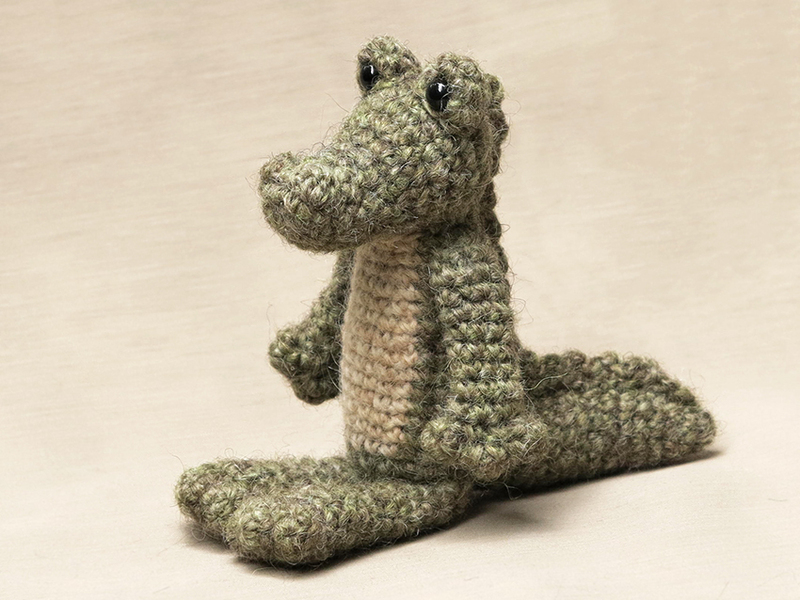 This ever so fluffy and cuddly crocodile is made with Istex Lett Lopi, a worsted weight wool. He is 13.5 cm / 5.6 inch when sitting. All the additional information you need to know about this pattern you can find in the shop listings. You can buy this pattern in my shop at Craftsy and in my shop at Ravelry or order it here. 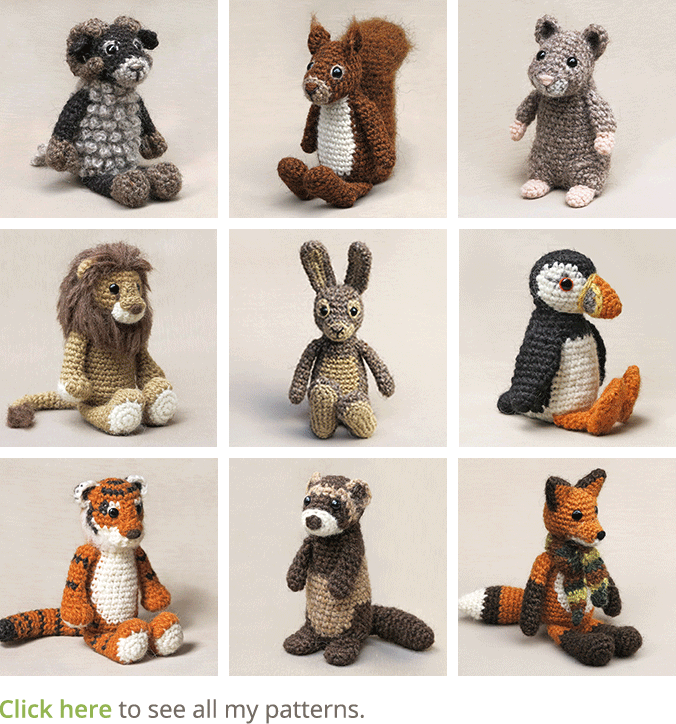 It contains a clear and colour coded description of how to crochet and assemble the crocodile with extra illustrations and example pictures at the bottom to help you get everything right. In the pattern you can also find what materials you need, the yarn colour numbers, in short, everything you need to know to make your own friendly reptile. And heads up, the pattern has a one dollar release discount till Friday the 30th. Aww, he’s gorgeous! Nowhere near as ferocious as the real thing. He’s made his appearance just in time for my holiday too :). Hi Chris, then you will have an airplane project, if a crochet needle is permitted…I wonder if there are real crocs where you are going. Thanks for stopping by and have a wonderful holiday! He’s a wonderful little guy! Can’t wait to make him.